At Tri-County Animal Hospital, we utilize only the safest anesthetics that are available. Prior to any procedure, all patients are given a thorough pre-anesthetic examination which includes blood work to ensure that your pet is healthy enough for anesthesia. 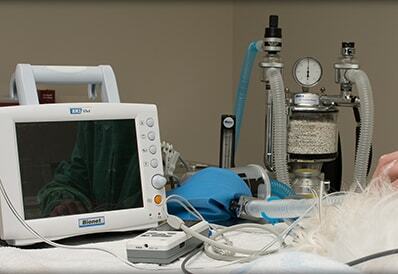 In addition, our anesthesia protocols are customized to the specific needs of your pet. During anesthesia, your pet is maintained on intravenous fluids and all vital signs (heart rate, respiratory rate, blood pressure, temperature, and oxygen saturation) are closely monitored. For our geriatric and high risk patients, we offer sevoflurane inhalant anesthesia to make any required procedure even safer. Our highly trained technicians will continue to monitor your pet closely during his or her recovery time. Your pet’s safety and comfort are our top priority – if you have any questions regarding the anesthesia protocols used at our animal hospital, please call us at (973) 831-2426.